Salsa Senorita spices up the holidays with all-natural salsas that add new life to leftovers and a flash of fresh flavor to family favorites. Known as 'the legally addictive' salsa, Salsa Senorita kicks quick and easy cooking up a notch by blending fresh ingredients in an all-natural salsa that's free of preservatives and artificial additives. Some like it hot for the holidays, and the creators of the Salsa Senorita line of all-natural salsas are adding a spicy twist to holiday entertaining with authentic southwestern recipes that are easy to prepare and sure to please. Even turkey leftovers get a hot new flavor in cheesy layered enchiladas- an impressive yet simple dish that’s remarkably healthy and low in calories and fat. A little salsa adds zest and excitement to all kinds of everyday dishes from meatloaf to pot roast to salads. There’s a great gallery of recipes that call for salsa on http://www.salsasenorita.com. Combine first 5 ingredients in sauce pan. Cook over low to medium heat for approximately 30 minutes, stirring occasionally. Do not boil. Place 6 tortillas on the bottom of 3 quart casserole dish; cover with 1/3 of the sauce and 1/3 of the cheese. Repeat layering twice, finishing with cheese on top. Bake at 350 degrees for 45 to 50 minutes or until top is golden brown. Let stand 10 minutes before serving. Serves 6. Serve with the Classic 5-minute Guacamole Salad found on http://www.salsasenorita.com. Salsa Senorita brand salsas are all-natural, uncompromisingly fresh and free of preservatives. 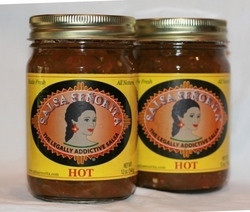 The ‘legally addictive salsa’ is available in Hot, Medium and Roasted Garlic flavors. Salsa Senorita brand salsas are produced by El Nuevo Foods and are available at fine grocery stores and specialty food markets in Southern California and New Mexico as well as Alabama markets including Whole Foods, V.Richards, Western Supermarket, Piggly Wiggly and many others. Salsa Senorita salsa, recipes and entertaining tips are available on line at http://www.salsasenorita.com.